MEN'S FLEECE POWER JOGGER PANT New Design Featuring a Comfort Fit, Tapered Leg with Ribbed Cuff, Side Pockets & Back Pocket! Once again Otomix listened to the request of our customers and brought you the latest in style and comfort! Otomix NEW Jogger Pant made of a super soft cotton/poly fleece. So comfortable, you'll never take them off. Every pant has the relaxed fit through the waist and thigh that tapers down to a ribbed cuff. 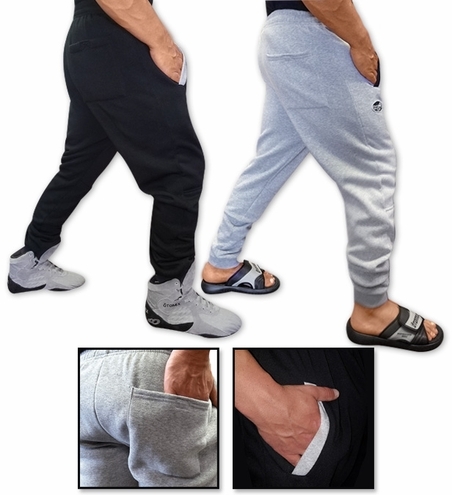 Two side seam pockets, a 2-inch waistband with drawcord, back pocket with Velcro closure and knee relief, make this one of the best athletic pants Otomix has offered. We covered all of our Otomix customer's recommendations. WE ARE SOLD OUT OF THE BLACK/GREY SMALL - WE DO HAVE THE BLACK/GREY SMALL WITH A LOGO! SEE ITEM #545OTO! The matching hoodie will make the perfect set, #575!